Every great party begins with great-tasting appetizers, whether it is an informal gathering of friends and family or an elegant champagne soiree. 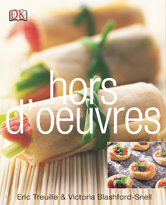 From spicy cilantro shrimp to eggplant caviar crostini, the authors show you how to prepare more than 250 simple yet sensational canapÃ©s, along with menu suggestions for a variety of occasions and indispensable advice on portion allocation and planning ahead. Illustrated with inviting, actual-size photographs of every recipe, this uniquely practical guide includes full-color, step-by-step instructions to ensure successful party food whatever the occasion.